For this special concert in honour of the 10th anniversary of the City of London Symphonic Winds, we present a programme that celebrates the birthday in different ways. The program is comprised of repertoire from our very first concert, (Holst, First Suite in E flat), transcriptions from playing members (Wilfred Heaton’s Toccata) other great works from the wind orchestra repertoire plus works from great English Composers. 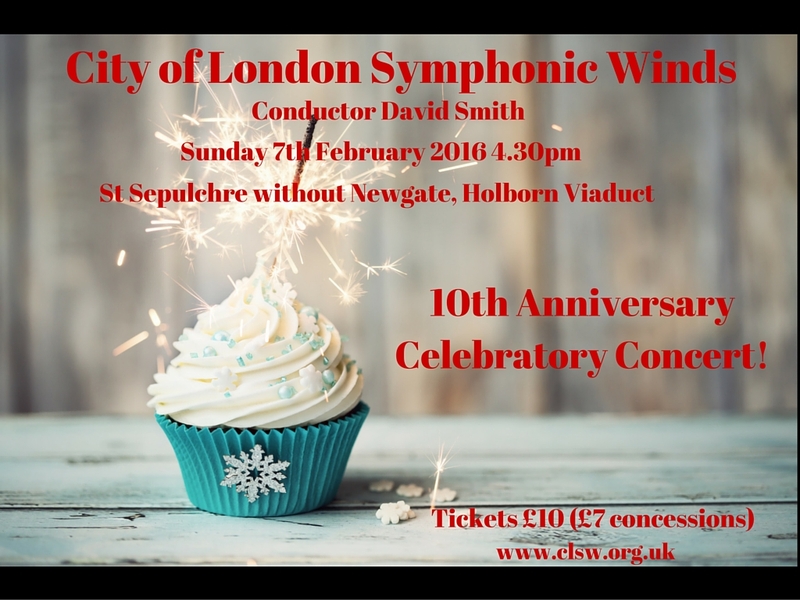 City of London Symphonic Winds Celebrates its 10th Anniversary in 2016. Join us for a programme of celebratory music including Holst's First Suite in E flat, performed at the group's very first concert in February 2006. This entry was posted in Concert and tagged Concert, london, wind band. Bookmark the permalink.